Boron (B) (atomic number 5 and atomic weight 10.81) has density of 2.34 gm/cc. Melting point of B is 2076 deg C and boiling point is 3927 deg C. B is a solid material at the atmospheric pressure and at 0 deg C temperature. The phase diagram of the Fe-B binary system and equilibrium phase diagram at low concentrations of B is given at Fig 1. B steels are becoming increasingly popular and their application is becoming more diverse. Their high properties, at a reasonable price, are achieved through advanced manufacturing technology. Although B steels were originally designed mainly for the hard, wear resistant elements, now they are also being used for a wider application. B is useful as an alloying element in the steel because of its effect on hardenability enhancement. It is added to carbon (C) and low alloyed steels at concentration levels of 0.0015 % to 0.0030 % for increasing the hardness level through the enhancement of hardenability. B reacts readily with oxygen (O) and nitrogen (N) and is not useful to steels if it is in combined form. Hence care is to be taken during steelmaking to ensure that B is adequately protected. If this precaution is not taken then it can lead to erratic heat treatment response. B is used in steelmakers as ferro-boron (Fe-B) which is a low cost addition agent. Fe-B comes in several grades. High C Fe-B contains up to 2 % C and normally comes in three grades containing (i) 10 %- 15 % B, (ii) 15 % – 20 % B, and (iii) over 20 % B. Low C Fe-B contains less than 0.5 % C and usually comes in two grades containing (i) 15 % to 17 % B and (ii) 17 % to 19 % B. Major impurities in Fe-B are silicon (Si) and aluminum (Al). Content of Si in all the grades of Fe-B is 4 % maximum. Content of Al in the high C grades is around 0.5 % while that in low C grades is around 6 %. Fe-B is also available in powder form as core wire. In order to get consistent and adequate recoveries, Fe-B is added in the liquid steels normally after the addition of other ferro alloys. B reacts aggressively with O, C, and N dissolved in liquid steel. B reacts with O to form B oxide (B2O3), with C to form iron B cementite [Fe3(CB)] and iron boron carbide [Fe23(CB)6], and with N to form B nitride (BN). Loss of B by O is prevented by making the B addition to Si – Al killed steels and by using good ladle and mould practices. Strong nitride formers such as Al, Ti (titanium), and Zr (zirconium) protect the B from reacting with N. Standard practice of B addition to the teeming ladle is after addition of all other alloying additions. It is usually done between the time when the ladle is one fourth to three fourth full. The loss of effectiveness of B can be prevented by using slightly higher Al and/or Ti (titanium) contents. Additions of B in continuous casting moulds had been successfully made for many years, but it has been noticed that these additions give less uniform results in comparison to carefully controlled additions to the teeming ladle. Cored wire additions can be made at the ladle furnace, argon (Ar) rinsing station or the vacuum degassing unit. The rolling and forging operations of steel containing B are similar to plain C and alloy steels though there is a slightly greater danger of overheating. The diffusivity of B in steels is about the same as that of carbon, and hence steels containing B may deboronize in high temperature oxidizing atmospheres. Also the atmosphere of the reheating furnace need to be kept low in N to prevent the formation of boron nitrides. The scale formed on B steels is not so tightly adhering as that on other alloy steels. This property of B containing steels improves the die life during forging operations. In case the amount of B exceeds the small amount needed in solution in liquid steel, it results into hot short steel which breaks up in the roughing stand or during hot forging. Even if there is no damage to steel during hot working, such steels more likely show poor room temperature impact properties. 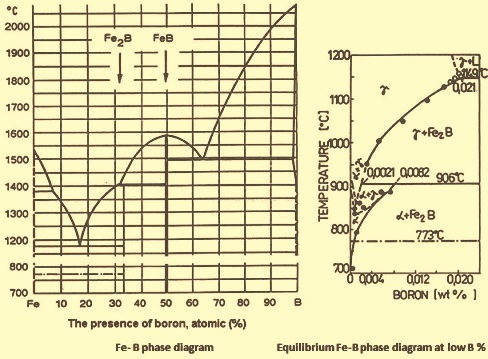 It is now recognized that these problems are due to the formation of a low melting point B-C-Fe eutectic (Fe2B/Fe3C/Fe), which forms when the content of B exceeds about 0.007 %. Only soluble B is effective for hardenability, so the normal aim composition is 0.0015 % to 0.0030 % B. B normally segregates, and there is possibility of forming dangerously high concentrations of B even if the average B content is within the specification. An outstanding feature of B steels is the improvement in hardenability produced by the addition of even a minute quantity of B. In case an excessive amount of B (greater than 0.0030 %) is present, the B constituents become segregated in the austenite grain boundaries, which not only lowers hardenability, but also may decrease toughness, cause embrittlement and produce hot shortness. B must be in its atomic state to improve hardenability, which means that care must be taken during steel production for the B to be effective. B may also become ineffective if its state is changed by incorrect heat treatment. For example, high austenitizing temperatures must be avoided as well as temperature ranges where certain precipitation of B occurs. B suppresses the nucleation of pro-eutectoid ferrite on austenitic grain boundaries but it has no effect on growth. The mechanism which is decisive for the enhancement of hardenability by B is a delay in the transformation to the bainite, ferrite and pearlite structures, which are softer than martensite. Unless prevented by B, these softer structures are formed during the cooling from the austenitization temperature, after annealing or hot working. The effect of B on hardenability also depends on the amount of C in the steels. The effect of B increases in inverse proportion to the percentage of C present. B is much more effective at low C levels, its contribution falling to zero as the eutectoid C content is approached. An interesting sidelight on this phenomenon is that carburized boron steels are marked by a high core hardenability but a low case hardenability. The effectiveness of B increases linearly up to about 0.002 % B, then levels off. Upper limits are set by the hot working and embrittlement considerations. Most specifications for steels containing B now define the allowable limits of B as 0.0005 % -0.007 %. B is unique among alloying elements in that its hardenability factor increases with the amount of martensite chosen as the standard. B has a relatively greater effect on a section that can be fully hardened than on one which quenches only to, say, 50 % martensite. As a practical matter, the effect of B on hardenability is often denoted by the ‘Boron factor’, the ratio of the ideal diameters of a B steel to the same steel with no B. Medium C steels usually have boron factors in the range 2.0-2.5. Lower values indicate a loss of B effectiveness through poor steelmaking practice or improper heat treatment. B has no significant effect on the transformation temperatures. Thus, B steels are heat treated the same way as comparable B free steels. Overheating is to be avoided. B is a grain coarsener and hardenability does not improve with increasing grain size. Hardenability loss through overheating can be regained by slow cooling and reheating to the proper quench temperature. Oxidizing and nitriding atmospheres are to be avoided. B steels are not to be carbonitrided. B neither raises nor lowers the Ms temperature and has no effect on retained austenite. It does not change the fineness of pearlite, nor it produces any solid solution strengthening in ferrite. It shows no effect on tempering response except a slight but tolerable increase in susceptibility to temper embrittlement. B has long been used as a replacement for other alloying elements in heat treatable steels, especially when these constituents were in short supply. It is also used in austenitic stainless steels to control hot shortness, or to improve their creep properties. B steels are used for a variety of applications, as a wear material and as a high strength low alloy (HSLA) structural steels. These are being supplied either as hot rolled or as quenched and tempered steels. B assures adequate hardenability in heavier plate sections. Examples include punching tools, spades, knives, saw blades, and safety beams in vehicles etc. B is added to some steels for the nuclear industry since it has a high neutron absorption capability. For this reason, it is added to certain type of stainless steels for use in the nuclear industry. Levels of 4 % B or more have been used, but due to the lack of hot ductility and weldability in these steels, B contents of 0.5 % to 1.0 % are more common for neutron absorption applications. For this application of B, the Fe-B has to be of the highest purity. B is also used in deep drawing steels, where it removes interstitial N and allows lower hot rolling temperatures. Carbon-manganese-boron (C-Mn-B) steels are generally specified as replacements for alloy steels for reasons of cost. C-Mn-B steels are far less expensive than alloy steels of equivalent hardenability. Applications for these steels include earth scraper segments, track links, rollers, drive sprockets, axle components and crankshafts. B alloy steels are used when the base composition meets mechanical property requirements (toughness, wear resistance, etc. ), but hardenability is insufficient for the intended section size. B is sometimes used in non-heat treated steels. Fe-B may be added as an intentional N scavenger in C steels for automotive strip stock. By avoiding interstitial N, B makes the steel more formable and eliminates the need for strain age suppressing anneals. There is a range of medium C steels with a deliberate addition of B to improve hardness during heat treatment. Toughened by tempering following oil or water quenching, B steels possess a hardness equivalent to that of much higher C steels and of more expensive low alloy steels. Advantages of B steels include improved cold formability, lower delivered hardness giving improved blanking tool life, improved weldability due to low C equivalents, lower tempering temperatures giving savings on energy, and good case hardening response. Typical applications include toecaps and chains.